Jacob “Jake” Pope’s family has a military history. Both grandfathers served in WWII, his father was in the Army during Vietnam, and his brother and sister were both in the Army. Jake, the youngest, joined the Marine Corps on the Delayed Entry Program while he was in high school, and went on active duty shortly after graduation. His initial specialty was in computers, and he deployed to Al Anbar Province in Iraq on his first tour in 2005. 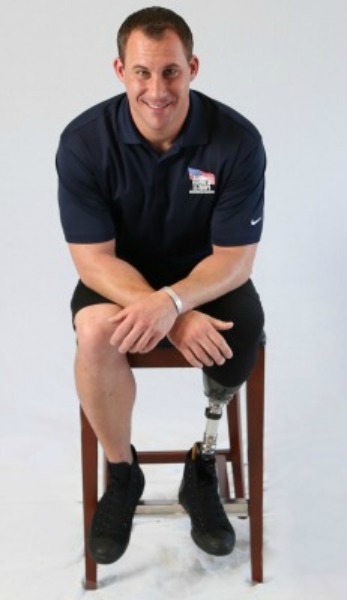 He re-enlisted for explosive ordnance disposal (EOD), and deployed to Afghanistan twice, once in 2008 and again in 2011. On Aug. 16, 2011, during his third deployment, Marine Sergeant Pope was serving with the 2nd EOD Company, 8th Engineer Support Battalion (ESB) in Afghanistan when he was injured by an improvised explosive device (IED). Sgt Pope was on foot patrol in direct support of the 3rd Battalion, 2nd Marines investigating multiple IEDs. He had neutralized two IEDs, when he was struck by a tertiary device. The blast resulted in the severe damage to his left leg, multiple breaks and tissue damage to his right leg, and second degree burns to his abdomen. He was transported to FOB Edinburgh, where doctors amputated his left leg. Once back in the United States, Sgt Pope was treated at Walter Reed, where he endured more surgeries and began to walk with his prosthetic. Now medically retired, Jake was previously living in a home that was not wheelchair accessible, forcing him to wear his prosthetic leg all day. This put strain on his right leg, causing new injuries to his knee. His bathroom was a safety risk and he often worried about falling, especially while his young daughter, Addison, was home. As a single parent, Jake’s primary concern is his daughter’s wellbeing. Addison’s room in the previous home was on the second floor, which made it difficult for him to reach her. His single-level specially adapted custom Homes For Our Troops home with an open floor plan allows Jake to care for his daughter without restrictions. He especially enjoys reading Addison bedtime stories without having to navigate stairs. Jake’s injuries have not stopped him from coaching Addison’s soccer team. Now that he is living in a barrier-free home, he has the ability to be even more physically active. He also has enough space to work on cars, a hobby that has helped in his recovery. The financial freedom of the home allows Jake to continue his college education. He is currently enrolled at the University of North Carolina Wilmington working toward his bachelor’s degree in K-5 education, with the intent of becoming an elementary school teacher. Jake is most thankful to Homes For Our Troops donors for the opportunity to be a better father to Addison. “This house is a way for me to continue to be an independent father to my daughter, and there is nothing more important to me than that,” he says.